jobs.ac.uk is delighted to announce the launch of its new mobile jobs app for iPhone and Android. 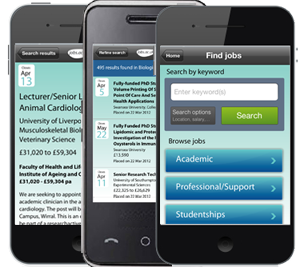 The free app allows jobseekers to search over 3,500 vacancies from universities, research institutions and commercial organisations worldwide directly from their mobile phone. In addition, the advanced job search allows jobseekers to save search results, shortlist favourites and email jobs to friends. The new app will make it quicker and easier for jobseekers to find and apply for jobs on jobs.ac.uk and will ensure that recruiters continue to find the best people and fill vacancies more quickly. The app is the first in a series of mobile developments by jobs.ac.uk and follows a significant increase in mobile users to the website, which has seen a 100% growth since June 2011. This trend is expected to increase further with the wider adoption of smart phones and the growing number of jobseekers using mobile devices to perform job searches. Paul Bartlett, Director of jobs.ac.uk commented “We are very excited to have launched our first mobile app to allow our jobseekers to search for jobs on the go. The number of jobseekers using mobile devices to access jobs.ac.uk has increased significantly over the past 12 months, so the new app will provide our mobile audience with the best access to relevant jobs wherever they are”.